ALLEGRA BOVERMAN/Staff photo. Gloucester Daily Times. Manchester: Alex Shepard of Manchester is working on his Eagle Scout Project titled "Remembering Our Veterans." 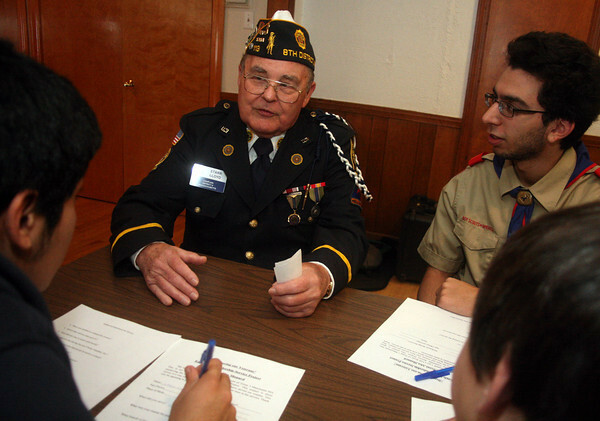 He is interviewing local WWII and other veterans on Veterans Day at the American Legion Post 113 in Manchester. Seated together talking, clockwise from upper left are: veteran and chaplain Starr Lloyd, interviewers Peter Gualakos, Thomas Ambrose and Andres Ramirez.